﻿ Event Management App - Where to Begin? Whether you are a professional event planner, DIY, planner, or business you’ll notice something very common with every event: something always goes wrong. Event Management App - Where to Begin? Seriously, always. Even seasoned professional event planners know this. And here’s the thing, it is hard on your own to figure out what problems can or will arise in your event. And these aren’t small problems either. These can be things like the event space being too crowded, last minute cancellations, and all sorts of miscommunications. Just think about that for a second. It seems like a small problem, as in, so what if it is a little tight. But what if you are planning your own wedding and the guests cannot move around and everyone is squished together. And what if that means that servers cannot get through, people cannot get out of their seats. And then what happens if because of all of that, someone trips and hurts themselves. These are serious concerns! And we haven’t even scratched the surface but fortunately, there is a solution. So here, we will be talking about EventForte’s event management app, which visually identifies problems that your guests may face. EventForte’s event management app was designed with the most common problems event planners face specifically in mind. So with that, let’s go through the different features that the event management app has. If you are a hospitality industry veteran, you know that 25 years ago, it really wasn’t possible to do diagramming of an event outside of pen and paper. And the long story short was that it was a mess. Whether you are DIY or a pro, it didn’t matter. Diagrams always led to some sort of confusion. Sometimes, not everyone was on the same page. Sometimes important people like vendors or the venue were not given the diagram. And many times, the event planner had to guess that all the furniture would fit well. 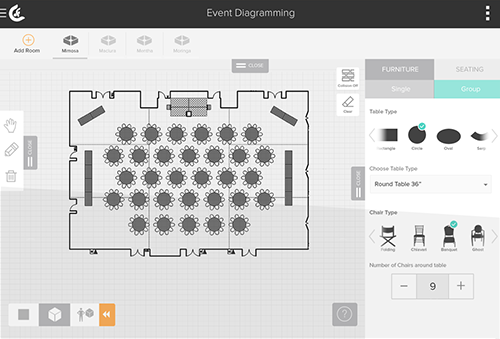 With the event management app, EventForte has taken the guesswork out of diagramming. 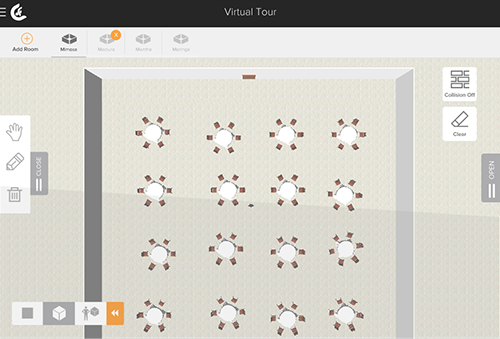 When you log into the app and go to diagramming, you are first presented a 2D vision of the room for your event for which you can create the correct dimensions. You then are presented with options for furniture which you can customize based on size and color. For tables, you can select from circular, rectangular, square, or serpentine tables. For chairs, you can select from Chiavari, Folding, Banquet, or Ghost chairs. When you know what type of tables you want, you simply put them into the 2D diagram, also with the option of deciding how many seats each table gets. You can then render your layout in 3D. Being able to do this has several benefits. Let’s start with how this can help you directly. By rendering the layout in 3D, you get a sense of how the event will feel the day of the actual event. This means you can see if the tables are too close together, if the colors look good, and so forth. Now here’s how this is great for everyone else you are dealing with. Whether your are DIY or a pro, your event diagram is only as good as the person who can understand it and see your vision. This was the hard part before. Now you can share your diagram with your client, the venue, vendors, and anyone else who requests it. We call this “visual communication”. 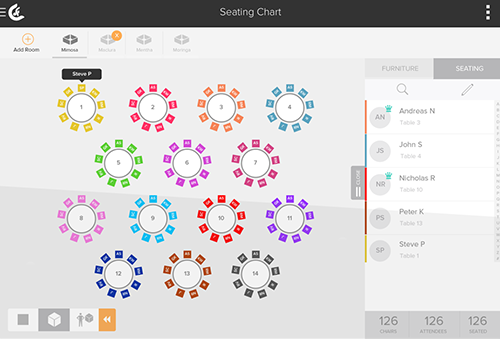 Another feature that the event management app has is an interactive seating chart. Firstly, let’s go over how to upload a seating chart. You can either upload each guest manually or you can upload all your guests in bulk. For each guest, you can input their first name, last name, email address, and which guest they are associated with if they are being added as a “plus one”. You are also able to share this seating chart with clients, vendors, the venue, anyone. It is also easy to add new guests, edit guest information, or delete a guest. Going back to the diagram you have created for your event, you can also create a seating chart. With your uploaded guests, you can place guests in the seats directly. Your seating chart will then be updated to indicate where each guest is seated. You can use this to play around with your seating chart with all your sharees having the most up to date seating chart. Back in the day, and even to this day, if your event had ticketing, check in used to be a pain. You were reduced to clipboards and a staff that had a very difficult time coordinating with one another over who was checked in, who had not yet arrived, and who had checked out. 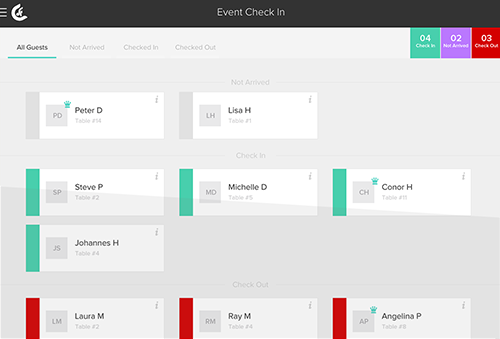 With the event management app, EventForte allows for collaborative check in. You can use a tablet and with the swipe of a finger, change the status of a guest. The event management app maintains three potential statuses for a guest: not arrived, checked in, and checked out. All guests start off as not arrived. By swiping your finger over a guest, that guest is then designated as “checked in”. Swiping again designates the guest as “checked out”. And lastly, swiping again cycles the guest back to “not arrived”. This means first off no more clipboards. It also means that your team will know when a guest’s check in status has changed. Through our users and studies we have performed, we’ve been able to isolate some of the main problems event planners have had and how the event management app has helped them solve those problems. So here are some of those common problems based off of real stories. One of the common problems event planners have is convincing their clients that a certain setup will not work. It becomes even harder when you are DIY and planning an event for the first time. First time event planners do not have as much of a sense as professional event planners as what will work and what won’t within a layout. And even then, coordination with venues and vendors, and figuring out if everything will fit properly is something even the most seasoned event planners worry about. But we’ll get to that problem later. For this, I want to introduce Debbie (all names here have been altered to preserve the real identity of the person). Debbie just got engaged and was looking for an event planning software to help plan her wedding. She eventually found EventForte. While planning her wedding and finalizing her guest list, she told the venue that she needed to accommodate approximately 200 guests. The venue told her that they could fit 25 standard banquet tables in the room. Debbie thought that this was a good solution as that would leave 8 people per table which made sense to her. Using the event management app, Debbie decided then to place 25 standard banquet tables in the room. While she noticed that all the tables would fit in such a configuration, with the 3D rendering, she noticed that the tables would be too crowded together. She was not able to walk around virtually with the well dressed man because he would get stuck in between tables. With this knowledge, Debbie took out 5 tables and increased each table’s limit to 10 guests each. She saw that with 3D rendering this would leave plenty of room between tables. With this knowledge, she went back to the venue, and asked for only 20 banquet tables. I can say now the wedding went off without a hitch (pun intended) and she is happily married. Had she not used the event management app, she would have gone with the venue’s ill informed recommendation and had a very cramped wedding. The above example has happened to countless event planners as well. Only with them they have to convince their client that a furniture configuration won’t work. One common event planners have in the coordination of an event are last minute seating changes. In events of dozens or even hundreds of attendees, a seating change can have dramatic consequences. We had one story where Mark, a seasoned event planner, had an event where literally 2 hours before the event, one VIP cancelled and two others demanded to switch seats. Now even in the days before technological innovations to the hospitality industry, last minute issues were tough. Here’s a common cancellation scenario: a VIP cancels last minute. That means every vendor, the venue, the food servers, the stakeholders all had to be informed separately. That would take a long time, even with a phone. What if everyone is yelling at you and no one can figure out the new seating configurations? This was a nightmare scenario for an event planner. So Mark was telling us that this very thing happened to him but because he had the event management app, he was able to nix the VIP and switch the VIP seating arrangements last minute. And because it was all done in real time, all the vendors, the venue, the stakeholders, they all had an updated seating chart immediately. He was even able to share a pdf of the updated seating chart by email to the relevant parties immediately after the cancellations and the last minute seat changes. So Mark, even though he has been planning events for many years, was for the first time, able to easily handle these last minute issues. Probably the number 1 complaint we have heard from event planners which I alluded to before is miscommunication. Event planners have a particularly difficult job because they have to communicate with so many parties at once. There are the clients, the stakeholders, the vendors, the venues, it just keeps going. That is why with the above problems involving diagramming and last minute changes, one of the underlying issues is a difficulty in communication. Sometimes events can be ruined by minor miscommunications. In the mess of hand drawn diagrams, maybe you had one idea what something was supposed to look like and someone else had an earlier draft. So with a lack of communication comes confusion. That’s what we are trying to avoid. One event planner, Lisa, told us about how useful the event management app has been with stakeholders. She plans a lot of corporate events. These can be with hundreds if not thousands of attendees with many rooms, big dinners, all that. And here’s the thing for Lisa: it doesn’t really matter how much lead time she has to plan the event: something always used to go wrong to some degree or there was some “fire” she would have to put out the day of the event. So when she tells stakeholders that certain configurations won’t work, a lot of the time they wouldn’t believe her or they would shut her down. What has been great for her with the event management app is she can actually prove to the stakeholders that her vision is the best and the stakeholders’ vision may not work. With the 3D rendering, she can show the stakeholders what she is talking about. She calls it her “proof”. Other planners have found that a lot of the miscommunications came with their teams. One planner, Kelly, has a 5-person company. Even with that many people, she had a difficult time being on the same page with all her team members. She had a difficult time collaborating because there were papers everywhere, a lot of different spreadsheets, it was just very confusing. With the app, she can collaborate with her team so that everyone is always on the same page. And lastly, we had a planner, Richard, who told us that his favorite part of the app is that he felt he could be more creative because of the app. One of the problems with having so many people involved in the event planning process is that playing around with certain ideas becomes dangerous. If you propose an idea, you have to ask a lot of people to see if it can work. And just even proposing an idea will give some vendors or stakeholders the idea that there is a change in plans or something like that. With the app, Richard has felt he can play around more with design because he will know immediately with the app if something will work or not work. So he can try to place tables, different furniture, explore different colors, and even different venues with the app. So that touches on some of the features of the event management app. What we have really enjoyed about making this product is giving planners, both professional and DIY (and all you small businesses out there) the feeling of confidence of knowing that their vision is becoming a reality. Event planners are plagued with these issues of being unsure, a lack of confidence that an idea will work, and general miscommunication. But the event planners who use our app have consistently told us that the app lets them feel like they have a much better understanding of their own ideas and gives them confidence that their vision will become reality. And maybe more importantly, they know they can handle the last minute issues that seem to ALWAYS come up.